Thirty ACORN members and allies rallied in front of Hamilton's downtown ODSP office to demand the provincial government show some love to ODSP/OW recipients. Leaders Mike Wood, Elizabeth Ellis and Raven Bridges spoke to the crowd about the importance of keeping the pressure on and challenged Doug Ford to live on ODSP/OW rates for 3 months. After chants and speeches, the rally moved inside to deliver a demand letter and broken hearts to senior staff at the ODSP office. Twenty-eight Ottawa ACORN members were joined by our allies from OPSEU at the local ODSP/OW office to demand the same 20% increase to the housing allowance that MPPs gave themselves! ACORN members signed a Valentine's Day card asking Minister Lisa MacLeod to meet with ACORN and delivered it, along with a bouquet of dead flowers, to the ODSP/OW office. 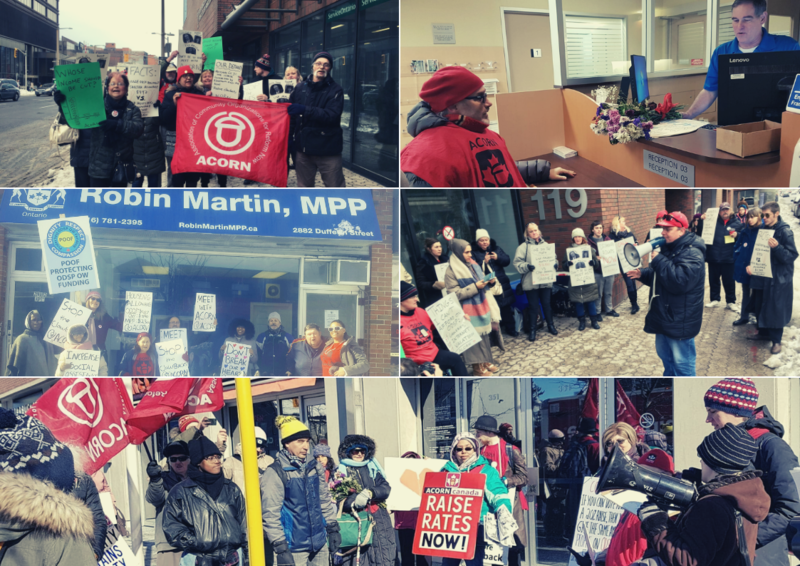 Ten ACORN members marched from Glencairn TTC to the office of Robin Martin, MPP for Eglinton-Lawrence in Toronto, who won her election by the slimmest of margins. ACORN members presented a Valentine's day card with our demands and a letter requesting a meeting.